I have been a fan of these camera lights for a few years now. I own several Neewer CN-126 and CN-160 camera lights. Some I use for my video shoots, a couple in the studio and one even illuminates me during my solo-acoustic shows. But did you know you can get add-ons that will turn this light into a great studio light? No batteries needed! Let’s start with this small camera LED light. The dimmable LED comes with 2 filters – diffusion and 3200K light for a warmer look. Take the filters off and you have 5700k lights to brighten any situation. The CN-160 LED can throw over 600 Lumens up to 20 feet. In my 10-12 foot studio (a.k.a. the second bedroom), two of these lights would be more than enough. I am adding a third to get a backlight as well. The CN-160 can take multiple battery types. An adapter for certain Panasonic batteries, Sony camera batteries (including my camera batteries) and even 6- double A batteries, which keep the light going for a good hour. Get the Neewer CN-160 Light system over at my Amazon Store! I found these a few months ago. Neewer created an adapter you can plug in using the F550 style connection, then simply plug the wall wart into a power source. The wart has a green light to show power. I have used these lights for hours plugged in and they do not falter. With these lights on (even with diffusion) can cause an eye strain. However, the softbox adapter for CN-160 can help alleviate that issue. The softbox also reduces light glare. They simply cover the light, and velcro in place (make sure you don’t cover all the vents, though). Finally, the Cowboy stand to bring the lights in the air. For the studio, 6 foot is more than enough. You can definitely get more expensive cowboy stands that go higher, but with the adapter system on the top, you can easily raise the lights higher with other adapters. The stands also have screws on top to attach the lights or another camera to – something other cowboy stands don’t seem to have. I had 3 florescent in front, and one behind me. 400 watts of light (160 watts of power) for video shoots. All with white cloth over each light to soften the look. This will be replaced with 2 in the front, one in the back. 27 Watts with 600 Lumens each in 3 directions. And the price – around $75 each. 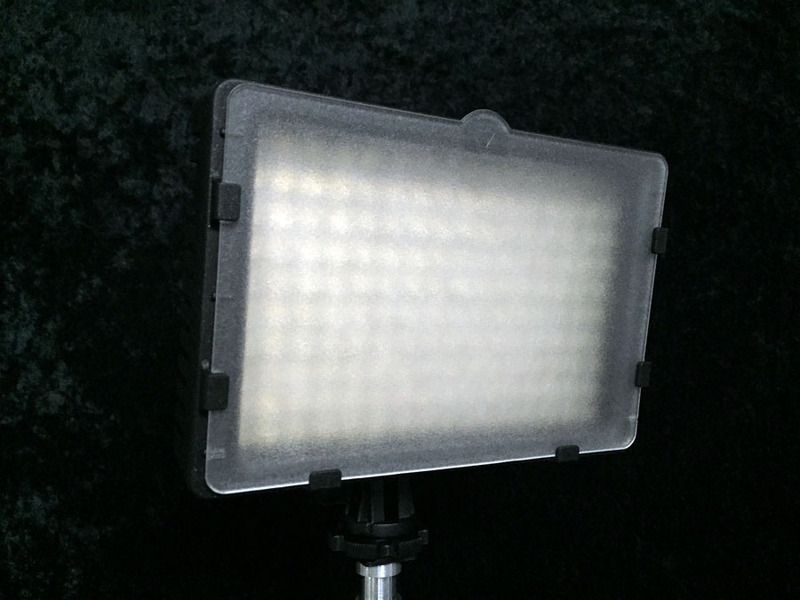 Compared to a professional light panel: 2-3 times more, and without stand, battery or softbox. Of course, the cheapest solution is the florescents with can clip lights at $25. However, you’ll have to deal with heat and placement issues, since they don’t have stands.